Sober Look: China widens the range for currency fluctuations, but is it really making the exchange rate more flexible? China widens the range for currency fluctuations, but is it really making the exchange rate more flexible? Today China announced its willingness to allow RMB (Chinese yuan) to fluctuate over a wider range against the dollar. PBOC: Effective from April 16, 2012 onwards, the floating band of RMB’s trading prices against the US dollar in the inter-bank spot foreign exchange market is enlarged from 0.5 percent to 1 percent, i.e., on each business day, the trading prices of the RMB against the US dollar in the inter-bank spot foreign exchange market will fluctuate within a band of ±1 percent around the central parity released on the same day by the China Foreign Exchange Trade System. And of course officials around the world are applauding the move. China is moving toward exchange rate flexibility and away from artificially keeping its currency weak. IMF (Christine Lagarde): "This underlines China's commitment to rebalance its economy toward domestic consumption and allow market forces to play a greater role in determining the level of the exchange rate." But is that what's really going on? With its GDP slowing and trade surplus at the lows, China is not interested in allowing the currency to strengthen. PBOC is pushing through stimulus to avoid a hard landing and a stronger currency will make that more difficult. In fact one needs to look at what Beijing is doing rather than what it is saying. 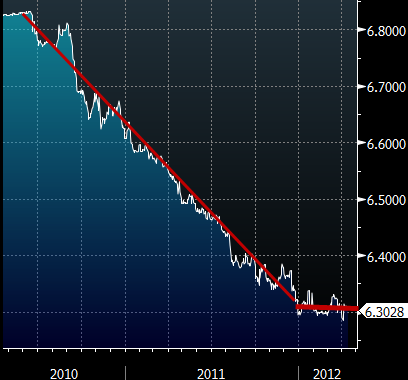 From the beginning of 2012, the RMB on average has not moved against against the dollar. So this wonderful policy change to widen the trading range will create larger fluctuations around the 6.3 level - making RMB look more like a free floating currency. But these fluctuations may simply mask the fact that PBOC is likely to keep the average level unchanged. It appears they've ended the policy of gradual currency appreciation that has been in place since 2010 - at least for now.